Direct from Ireland, Difference Engine is an evolving serial exhibition, and a model of autonomous artist curation, by artists Gillian Lawler, Wendy Judge, Jessica Foley, Mark Cullen & Gordon Cheung. Each Manifestation of Difference Engine is based upon an ongoing collaboration, a kind of ‘Jamming’, between the artists. The result yields engaging experimental exhibitions combining installation, video, painting, sculpture and writing. MANIFESTATION III will also see the first articulation of D.E. Chronicles, a serialized publication to accompany (but not represent) the Difference Engine exhibitions. D.E. Chronicles: Episode. Difference Engine:MANIFESTATION III will include a program of live readings and performance, featuring the Irish band BLOODYENDS, and workshops by the artists will run concurrently, promoting audience engagement and creative response. 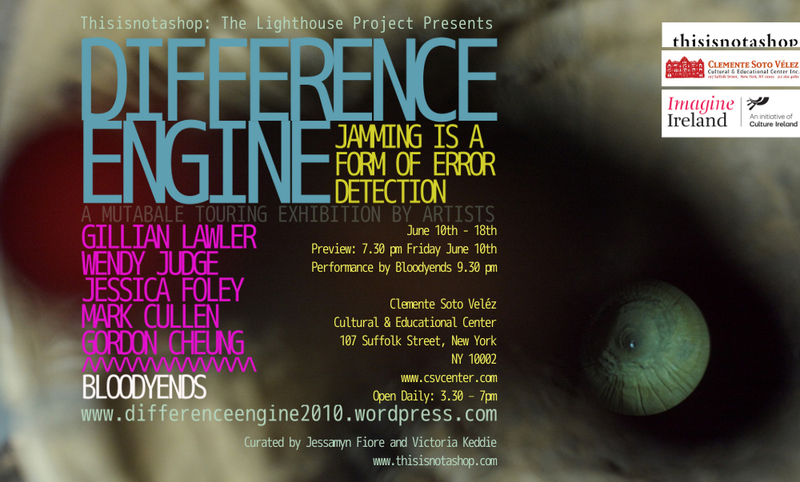 A night of auditory performances by New York based artists in response to Difference Engine will conclude the show. Saturday June 11- Sun June 12 : Artist Workshop led by Jessica Foley & Jessamyn Fiore. Wednesday June 15: The Literary Event: an evening of live readings featuring Irish authors curated by Belinda McKeon. 6.30pm-9pm. The CSV Cultural Center is located at 107 Suffolk Street, between Rivington Street and Delancey Street, on the Lower East Side of Manhattan. By train: Take the F train to Delancey Street or J , M , or Z to Essex Street. Walk to Suffolk Street, make a left. Proudly sponsored by Culture Ireland, Thisisnotashop and the Lighthouse Project.